Spray Foam is the best insulation on the market today. The benefits you will receive from Spray Foam cannot be matched by any other type of insulation. Spray Foam seals cracks and crevices sealing out air and moisture. Spray Foam is sprayed on in a liquid form and expands to fill cracks and crevices while forming an energy efficient barrier. Foam Insulation can save you up to 40% on energy bills. It increases the structural integrity of your structure, deadens sound, reduces allergans, moisture causing mold and is great for hard to reach places. Spray it offers several different products. Closed cell and open cell, as well as injection foam. We apply several different brands of foam, all of which are environmentally friendly. Spray Foam Insulation provides you with a comfortable, healthy living environment, both in the winter and summer and improves your homes overall energy efficiency. 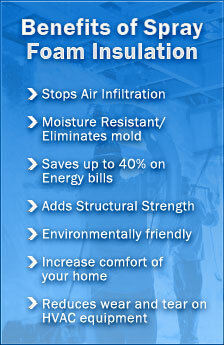 To see how Spray Foam Insulation can work for you please contact us for more details and a free estimate.